Enjoy a decadent chocolate dessert without the guilt with this easy-to-make, low-calorie, low-fat recipe from Weight Watcher’s! Preheat oven to 325 degrees F. Spray a 9-inch pie plate with non-stick cooking spray. In a large bowl, beat the egg whites with electric mixer at medium-high speed 3 to 4 minutes or until soft peaks form; gradually add the sugar and continue beating at medium-high speed 2 to 3 minutes longer or until stiff peaks form. Using a rubber spatula, gently fold in the cracker crumbs, nuts and vanilla just until blended. Scrape mixture into the pie plate. Bake 25 minutes or until firm and a toothpick inserted in the center comes out clean. Cool completely on wire rack. Spread frozen yogurt over the pie; freeze, covered, for 2 to 3 hours or until the yogurt is very firm. 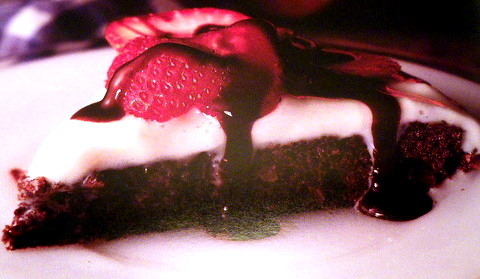 Top with sugar free chocolate syrup and fresh strawberries, if desired.